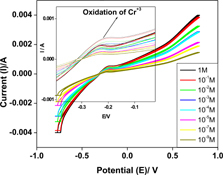 Synthesized thiophene derivative was used for the detection of Cr(III) ions in water by electrochemical technique using the modified carbon based electrode. Various electrochemical sensing methods were used to study the response of the modified electrode to chromium ions, such as cyclic voltammetry, differential pulse voltammetry, sweep step function, Tafel and the amperometric i-t curve analysis. It is observed that the copolymer is highly sensitive towards the chromate ions. The area of cyclic voltammetry loop decreases with decrease in concentration and peaks appeared between -1 to -1.3 V for all concentrations. Sweep step function indicates that the characteristic peaks appeared at -0.2 V due to oxidation of Cr(III), which is further supported by Tafel plot.